Aamir Liaqat, the pioneer of Ramzan Transmission and king of ratings, has left BOL TV, he has tweeted a while ago. Anchor alleged that BOL TV is yet to clear his dues but didn’t mention for how long the dues have been in pending. Aamir Liaqat, who has remained the center point of countless controversies, has warned the fellow media men to not to join BOL or they can do it at their own risk. BOL TV, in response has said that Aamir Liaqat had not informed the channel and its management in advance about the move. 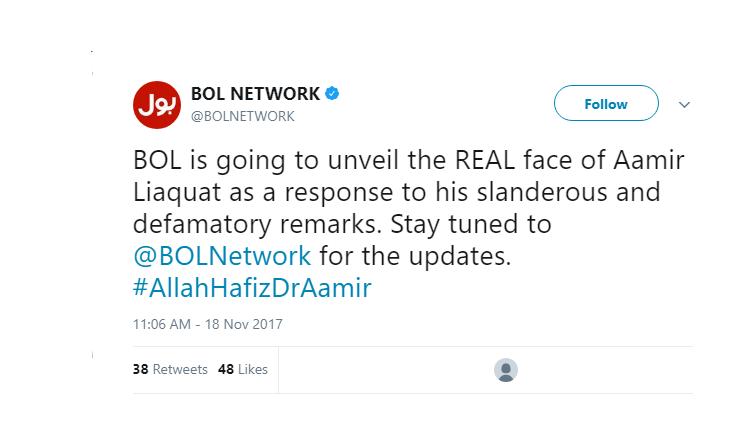 BOL TV, through a press statement, said that Mr. Liaqat’s resignation came through a tweet and that its highly unprofessional of Aamir Liaqat. During his stay at BOL TV, Aamir Liaqat took on several personalities and bashed them to his limits. But he was quick to apologize from all those who were hurt due to his shows at BOL TV. Mr. Liaqat alleged that it was the BOL administration that forced him to say bad words about certain people. He also alleged that BOL TV didn’t give any planes or land cruisers to its Ramzan Transmission winners. Media reports are suggesting that Aamir Liaqat is yet to lock a deal with any other channel. It is yet to be seen where he will head next, particularly when he has deteriorated his relations with almost all major media groups in Pakistan. This guy is the lowest of the low. I don’t know why our media gives him any attention. Without it, he’s nothing. Even his degree is fake. Its not the media. Its the people who give and keep giving him attention, thats why he keeps returning. Do you think this institution we call “establishment” ever learned from its mistakes or will ever learn? They think themselves as “passed out” genius. If you criticise them it is linked with your loyalty with the country but in fact if they stay within their constitutional limits they will be good in their actual professional work. From day one we are told they are saviours and politicians are corrupt but what damage establishment caused to this country no one even talks about it. Bangladesh is just one example. Aamir Liaqat like and others on channels running propaganda shows every hour clearly run it on scripts they are handed over by establishment. If establishment did’t learn i am afraid history will repeat itself…. @ali_salman:disqus Selaab aa jaye, army. Zalzala aa jaye, waha army. Karachi me pani bhr jaye waha army (ye to khud aamir liaqat ne dikhaya he). Dehshatghrdi ho wo b army ki zimedari. Security deni ho, wo b army.. Oh bhaye ye batao Siasatdaano ne kia kra he? Army corrupt hogi, bilkul hogi, km se km deliver to krti he. Oh bangladesh!!!! haha.. ye b Army ne kia tha.. Bhutto bechara masoom tha? Shaikh Mujeeb to bechara wo b masoom tha.. Mukti bahini b bechari k’hi khoye bethi thi.. History nae parhi tum ne.. Qaumi assembly ka ijlaas Army ne bulana tha ya in siasatdaano ne jis me PM ka faisla hona tha? It’s pretty obvious why. Yes, we all agree that army does deliver. But we must keep in mind that our media is controlled and doesn’t name them in corruption, while politicians are given open criticism (you won’t see a general’s cartooned version or his parody, for example). This leads to a popular opinion that politicians do not deliver, which might be true. But the main problem is that the system itself isn’t continued for long in order to bring about a new leadership (the one capable of delivering), as it’s taken over within a decade. Under dictatorship, new puppets are popularized, and then you see a continuation of it. When that puppet becomes independent, he is vehemently criticized. I don’t mean that he shouldn’t criticized, but that he should be criticized from day one, so that people don’t keep re-electing the same people over and over, and not bring in others who may do something good for the country. is bande ka koi deen eeman hae? Dajjal aya to yeh uska mureed ban jaye ga? koi zabta koi asool hae? One will be too silly to think this for him, what about ARY? They are so good in defaming anyone without any good evidence and are never sorry for it. Full fauji program. is k apne bare mein kia khayal hae? full chutya? ویسے بندہ اچھا ھے اپنی کی ھوئ بغیرتیاں مان جاتا ھے. lo gi wo dunya ka bewakoof ho ga jo aisa samjta hai, es chawal k shar se allah pak hamare hifazat framae, mje smj ni ati aj tak bi es ko jaga dene wale mojoood hai. Why ppl even see his program. I will never understand. He is just and extremist who is spreading religious extremism. We should stand united as Pakistani.